Quentin Jacobsen has been in love with his next door neighbor Margo Roth Spiegelman forever. They used to play together as children but when they both got older and went to middle school and then high school, Margo became part of the popular crowd and Quentin became part of the nerdy crowd. When Margo suddenly shows up at his window one night, a few weeks before the end of senior year, asking him to help her play a series of pranks, he follows her with very little hesitation. After spending the night driving all over Orlando with Margo, Quentin expects the next day at school to be very different. What he didn’t expect was Margo to disappear, and to become even more of a mystery to him than she already was. As I’m sure most of you know, I am a huge fan of John Green. I absolutely loved The Fault in Our Stars, Looking for Alaska, and Will Grayson, Will Grayson, so I had no doubt I would love this one. While I will say it was definitely not my favorite of his books, it was still an excellent one. I feel like I really understood what this book was trying to say. Quentin has built up Margo in his mind as this person who is almost more than a person. He has her up on such a pedestal that he can’t imagine her ever making a mistake or doing something that would upset him. He sees her in his mind as such a perfect girl that he doesn’t realize that maybe she is actually not perfect at all, and is just waiting for someone to realize that. This book is really about learning to see people for who they are, rather than who you want or imagine them to be. I think this is definitely something that a lot of us are guilty of–we get upset with people when they don’t fulfill the expectations we have of them, when really we need to understand that we are all different and can’t live up to the same standards as everyone else. Quentin is guilty of this throughout the book not just with Margo but with his other friends as well. He gets upset when everyone isn’t as obsessed with finding Margo as he is, or when people are more excited about other things, and throughout the book he finally learns that you have to accept people for who they really are and not who you want them to be. I honestly didn’t really like Margo though. I understand that she had a lot of her own issues and that people were ignoring what was really going on with her, but at the same time she is extremely self centered. She disappears and all of the people who care about her, including her 11 year old sister, are left hurt and scared, wondering if she is even alive. Quentin invests so much time into figuring out what happened to her, and at some points it seemed like it wasn’t even worth what he was going through. He did learn a lot about himself and his friends along the way, and he was able to become more confident as well. 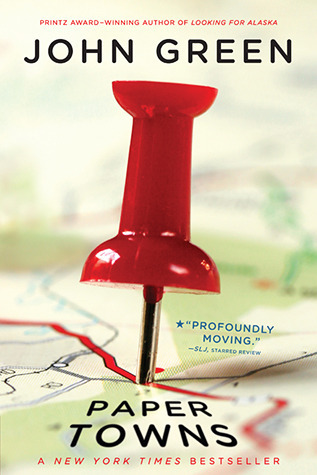 Overall, Paper Towns was a great coming of age novel. I highly recommend any of John Green’s books! Paper Towns was released on October 16, 2008.